Plaque is a sticky substance from saliva, oral bacteria and food debris that snaps on and between the teeth. If it is not removed regularly, the number of bacteria and tooth decay and gum disease can occur. Acids in plaque attack the tooth enamel. 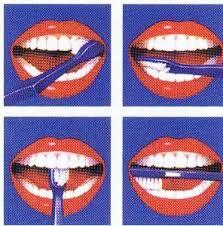 It is recommended to brush three times a day for 2 to 3 minutes the teeth and flossing. The bacteria will die off and calcify under the influence of the saliva into tartar. Prevention can be done by cleaning. Scratch off you better leaveto the dentist. A paste of the same amount of mistletoe leaves and fennel on the gums with a sore tooth would work since the Middle Ages effective against toothache. Previously cloves were given as anesthesia in a painful tooth or in the space between the cheek and sore tooth. In addition to the active ingredient eugenol clove also contain the flavonoids kaempferol and rhamnetine. Who are helping to increase the anti-infective properties of eugenol. Also garlic and parsley would have an analgesic effect. As brush is a flat beatened twig of a tree or plant usable. Make your own toothpaste e.g. with a base of coconut oil or bentonite clay. Peppermint (oil) is often added as a fragrance and flavoring. Also baking soda and various spices (cloves, cinnamon, turmeric). As an abrasive or tooth soap are (bicarbonade of-, or baking) soda, chalk, glycerin, peppermint oil, clay or ash possibly with herbs usable. You can e.g. add juniper, which has antiseptic and antibacterial properties. Alder: chewing on pieces of bark to clean the teeth. Mallow (Althaea officinalis) or (wild- a.o.) mallow (malva): chew the dried root or use as a brush. Dogwood: grind the bark as tooth powder. It protects gums and keeps teeth white. Red dock (or Show all (Rumex aquaticus)) and great water dock (Rumex hydrolapathum): the dry and crushed root cleans the teeth and also has a disinfecting effect. Lesser Celandine (Ranunculus ficaria): use the petals. (Wood) avens (Geum urbanum) contains eugenol and therefore smells as cloves. It is an antiseptic, local analgesic substance. It would be used dried and ground also in cooking to replacing cloves. A Chinese encyclopedia from 1498 mentions that the hard hairs of the neck of a Siberian wild boar in a handle of animal bone were fixed to brush the teeth. Later were rather softer horse hair brushes used in Europe. There are reports of Etruscans who had around 700 BC already dentures of animal and human teeth. In the 15th century in Europe were bone and ivory teeth with wire attached to the remaining biters. That sounds like it must have rattled. In 1791 Nicolas Dubois de Chemant received a patent for porcelain teeth.